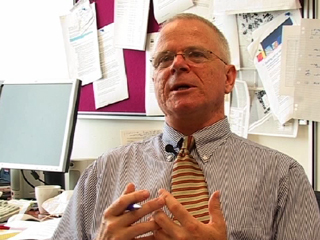 Video clip synopsis – Stuart Cunningham on the technologies of the future. Broadband MP4 digitalisation_bb.mp4 (5.2MB), suitable for iPods and computer downloads. Digital broadcasting provides higher-quality viewing and more television services by using the same digital technology used in computers, compact discs and mobile phones. Australia’s full conversion from analog to digital television will be complete in 2008. The change from analog to digital television will give viewers more choice with multi-channel programming as well as broadcasts with cinema quality images and surround sound. Digital TV will also let viewers receive 'enhanced television services’ such as subtitles, captioning, datacasting and a choice of viewing angles, plus Internet features like email, web-browsing and access to online services – all via their television set. Where do you think Stuart Cunningham sees personal media technology heading in the future? Personal media devices such as ipods, mp3 players and personal DVD players seem to be making us, as a society, more isolated from each other. Do you agree or disagree with this statement and why? Design a personal media device that you would like to own. You should incorporate at least four different media forms such as a phone, camera, television and radio. Is there something similar being produced or how long do you think it will be before it is made?